The Frontiers of Truth, by Geoffrey A. Pocock. View/Buy “The Frontiers of Truth” on Lulu. The Frontiers of Truth is the third book by Geoffrey A. Pocock, a handsome, casewrapped hardcover volume, 236 pages. The Legion of Frontiersmen was formed in 1904 for fellowship and service to the State at any time of need. 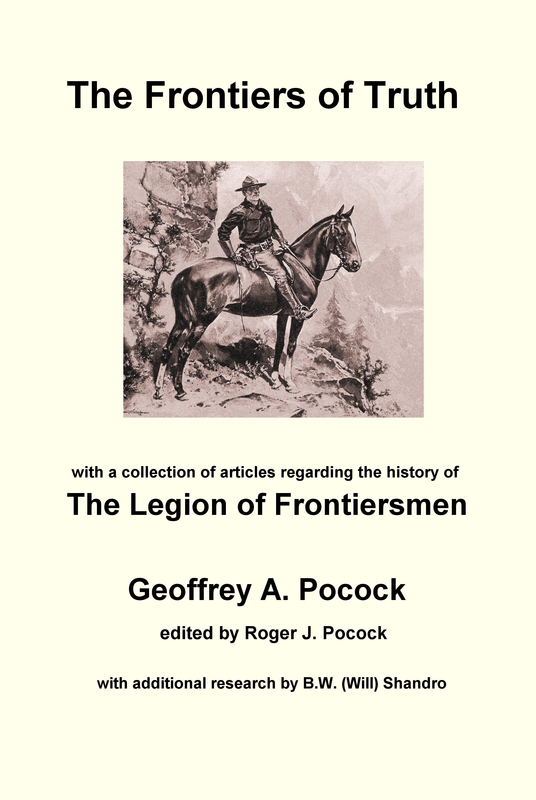 Its first official historian, Geoffrey A. Pocock, has written two books in connection with the Frontiersmen, One Hundred Years of the Legion of Frontiersmen, and his biography of the founder of the Legion, Outrider of Empire. This advertisement appeared on the back page of the May 1938 edition of “Frontiersmen – Official Gazette”. What a lovely place it appears to be. Just the place to visit on a summer Sunday for tea, a stroll in the gardens, and perhaps a gentle dance in the evening. Sounds idyllic. One wonders how many readers of the Frontiersman’s magazine knew that the colloquial and well-known name for Pomfret Cottage was “Fornication Cottage.” The registered owner of the establishment was in fact the lady friend of Legion Captain “Count” Johnston-Noad. It was well known to the police, who kept it under surveillance, and was the subject of many complaints by local residents. It was reported that a naked fat lady had been seen running round the grounds while several men chased her, hitting her on the bottom with paddles. To discover more about the “Count”, a very dodgy solicitor, and his extraordinary life you need to read “Frontiers of Truth”.